If you’re suddenly seeing your deceased Sims return to life in a more ethereal form, don’t panic: it’s just a new free update to The Sims 4 to celebrate that spooky time at the end of the month. 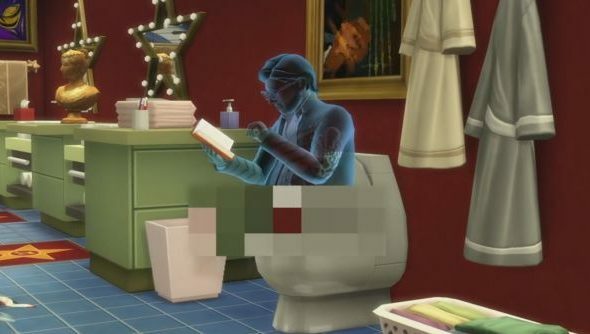 Your beloved Sims that have passed away now may roam your household causing all sorts of mischief. Their behaviour is influenced by how they bit the dust; I hope no one died in a house fire. Next month we’ll also see the return of pools, which is nice. You can expect to see the population of ghosts who died by drowning to sharply increase when that happens. Your now transparent loved ones will keep their traits from their former life, and their spontaneous behaviour is determined by how they died. You might have you hands full with a ghost trying to start house fires, or maybe a good few laughs by ones that died a more comedic death. There’s rumours that you can even invite them into your household as a playable character, and even resurrect them back to their more life-filled selves. In November, pools will be added back into the game. Details are sparse, but I’d assume they’d function just as previous ones did. Unfortunately, there’s no word on any plans to add toddlers back into the game. Approaching Christmas, The Sims 4 will also allow Sims to pursue new career choices and earn a multitude of new toys/rewards.